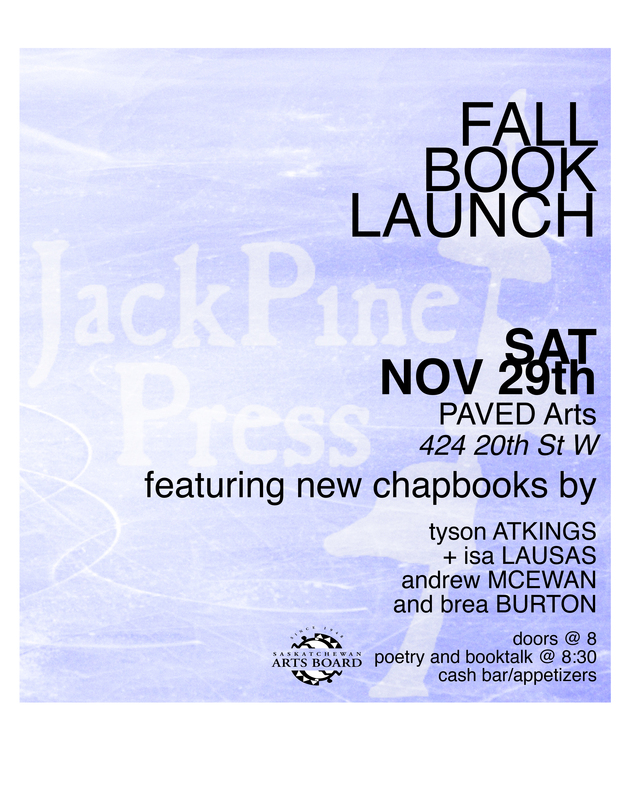 We are getting set to celebrate three new limited edition chapbooks by artists from Vancouver, Fort McMurray and Saskatoon with a launch party Saturday, November 29th at PAVED Arts in Saskatoon. From a book of hockey poems by a poet who doesn’t like hockey poetry, to a magnetized dialogue between self-effacing lovers, to a narrative of sentence fragments that layers like clouds in which we can see our own shapes, each one of these art objects has been stitched, glued, and cut by hand to showcase excellent poetry with unmatched design. I Exi(s)t/ exit I by Isa Lausas and Tyson Atkings is three books in one. One monologue by each author sandwiches a dialogue between them in a third signature. The book is bound with an embossed white vinyl wraparound cover that opens to reveal the text in three different ways. It is the record of a budding romance; it is visual poetry; it is an experimental examination of how two minds exists individually and socially. Conditional by Vancouver-based poet, editor and designer Andrew McEwan uses weather reports of fog and product return policies to map the persistent anxieties we all feel – in an unexpectedly tranquil and handsome way. puck bruise bloom black is a book of hockey poems born out of a love for hockey and a bitter dissatisfaction with hockey literature. Poet and designer Brea Burton disrupts the histories, nostalgias, narratives and stereotypes assigned to the game with her own, blood-dripping-on-ice experiences. Isa Lausas is a photographer and writer, born in Tornio, Finland. Isa graduated from the Academy of Fine arts of Marseille in France in 2012 (photography). Her first collection of poetry, On That Border, was published in Finland by Art-Arc in 2012. She is completing an MFA in Creative Writing at the University of Saskatchewan. Tyson Atkings is a visual artist and writer whose visual work has been exhibited in Saskatoon at the Void Gallery, the Gordon Snelgrove Gallery, AKA, the Metro Toronto Convention Centre and the Federation Gallery in Vancouver, BC. Andrew McEwan’s latest book of poetry, repeater (Bookthug, 2012) was shortlisted for the 2013 Gerald Lampert Memorial Award. His poems have appeared in The Rusty Toque, Poetry is Dead, COUGH, and the anthology Gulch: an assemblage of poetry and prose (Tightrope Books, 2009). Brea Burton is the co-author of Booty: Hurricane Jane and Typhoon Mary (with Jill Hartman, The Murcury Press, 2007. She has published her poetry in Matrix Magazine, Filling Station, and NoD magazine. She lives in Fort McMurray, AB.